According to conventional historical wisdom, Irish nationalism in Canada was a marginal phenomenon - overshadowed by the more powerful movement in the United States and eclipsed in Canada by the Orange Order. The nine contributors in this book argue otherwise - and in doing so make a major and original contribution to our understanding of the Irish experience in Canada and the place of Irish-Canadian nationalism within an international context. Focusing on the period 1820 to 1920, they examine political, religious, and cultural expressions of Irish-Canadian nationalism as it responded to Irish events and Canadian politics. They also look at tensions within the movement between those who argued that Ireland should share the same freedom that Canada enjoyed within the British Empire and revolutionary republicans who wanted to liberate both Ireland and Canada from the yoke of British imperialism. 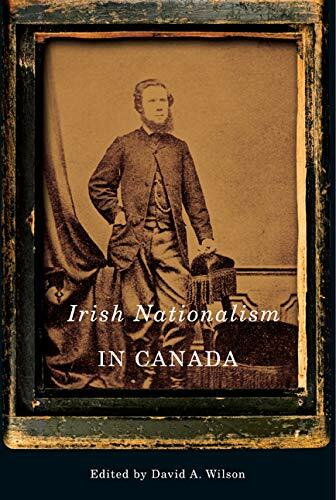 Irish Nationalism in Canada sheds light on questions such as transference of old world political traditions into North America, the dynamics of ethno-religious conflict, and state responses to a revolutionary minority within an ethno-religious group. Contributors include Donald Harman Akenson (Queen's University, Kingston), Sean Farrell (Northern Illinois University), Mark G. McGowan (St Michael's College, University of Toronto), Frederick J. McEvoy (Independent Scholar), Michael Peterman (Trent University), Garth Stevenson (Brock University), Peter M. Toner (University of New Brunswick), Rosalyn Trigger (University of Aberdeen), and David A. Wilson (University of Toronto).